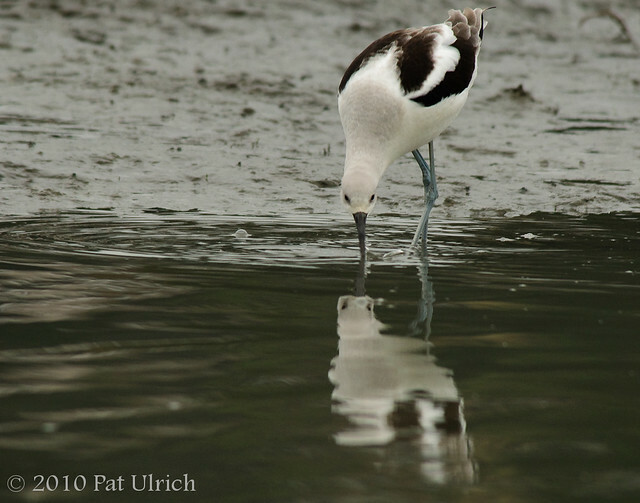 The travel itinerary of my 2016 trip to California include a few nights in the South Bay, which meant I was in a great position to look for American avocets. 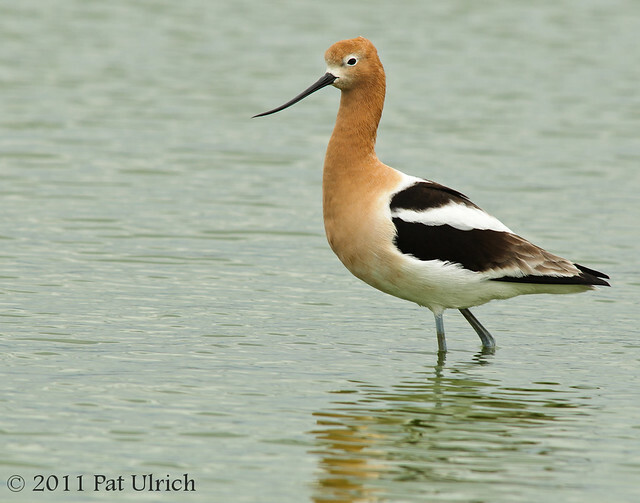 In my opinion, these are by far the most elegant shorebird species, and I greatly miss having the chance to find them here in the Northeast. 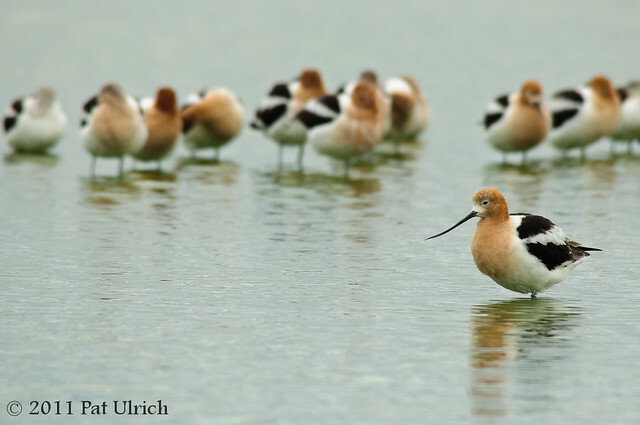 They're especially photogenic in their breeding colors, and it was a treat to encounter salt ponds filled with them at Don Edwards National Wildlife Refuge. 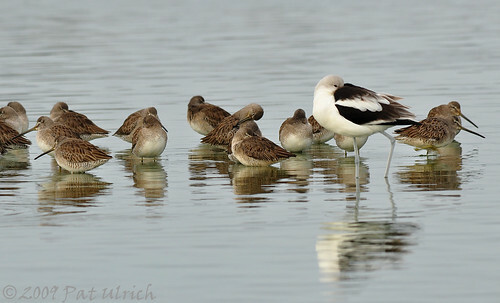 This location was one of my early favorites on San Francisco Bay, and I had a handful of spectacular trips there when I was learning the ropes of shorebird photography a decade ago. The park can be a little tough for eye-level photography since the trails are on elevated dikes around the ponds, but on this day the water level was down far enough that I was able to get low in the mud at a few places. 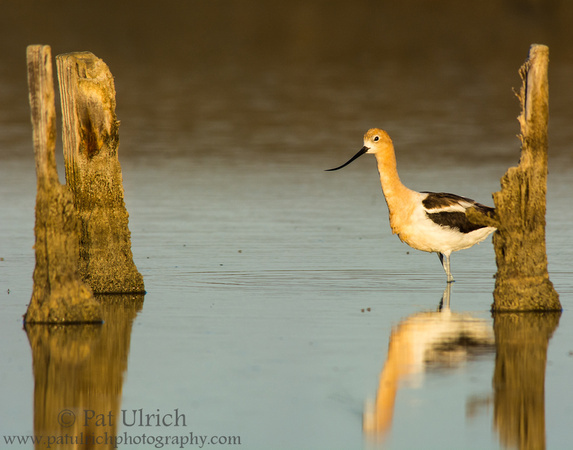 This curious avocet waded fairly close to where I was set up, and the old degrading pilings were an interesting setting to contrast the elegance of the bird. 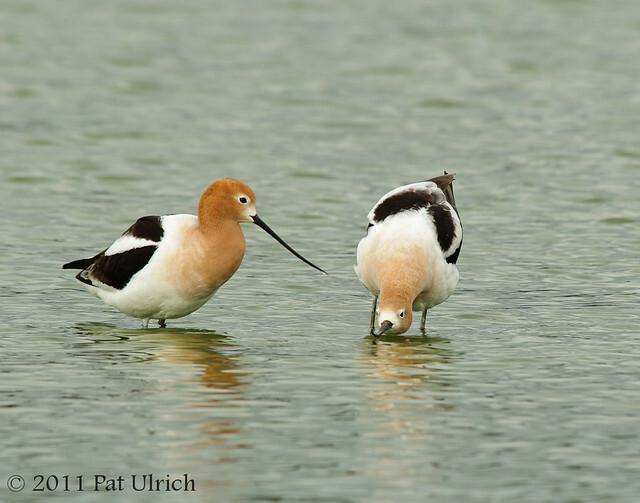 Shared with Wild Bird Wednesday -- follow the link to see this week's posts. On my way back from Pillar Point Harbor last month, I decided to take a slight detour to Radio Road Ponds in Redwood City. 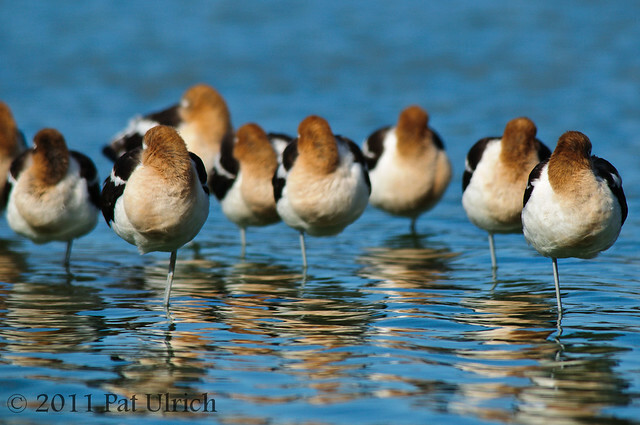 I was delighted to see a large flock of American avocets resting in the shallows near a convenient place to set up a tripod. While they were far enough away that making a compelling image of a single bird was difficult, it was a fun challenge to find some pleasing compositions within the flock. 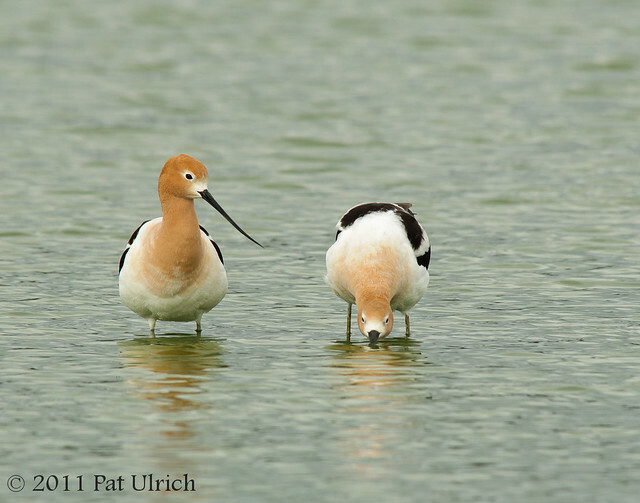 Many of the birds were busy preening, but occasionally they would all tuck their bills into their feathers to rest. 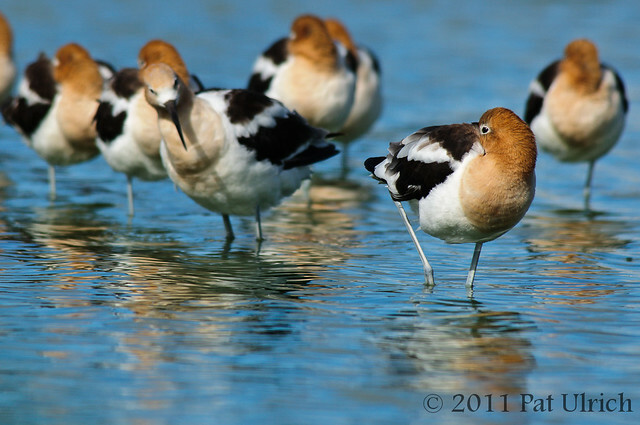 I really love the shape of a shorebird in this pose, and it's always nice to photograph such a relaxed subject. The rippled reflections were a nice bonus too. 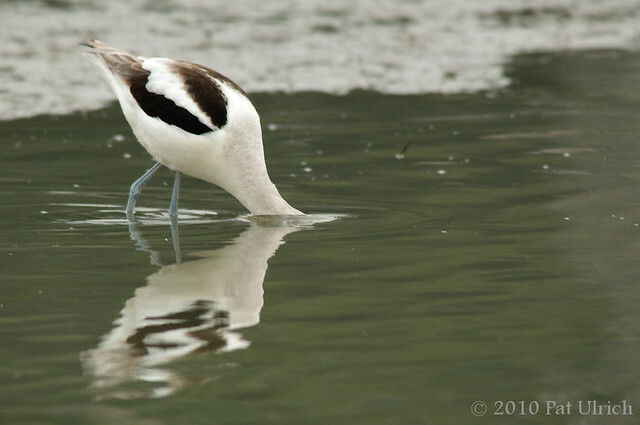 More photographs of these elegant shorebirds in my Stilts & Avocets gallery. 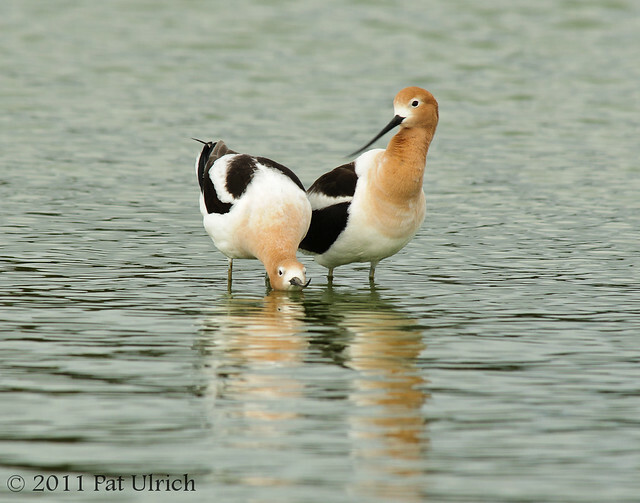 Submitted to World Bird Wednesday -- follow the link to check out this week's posts! 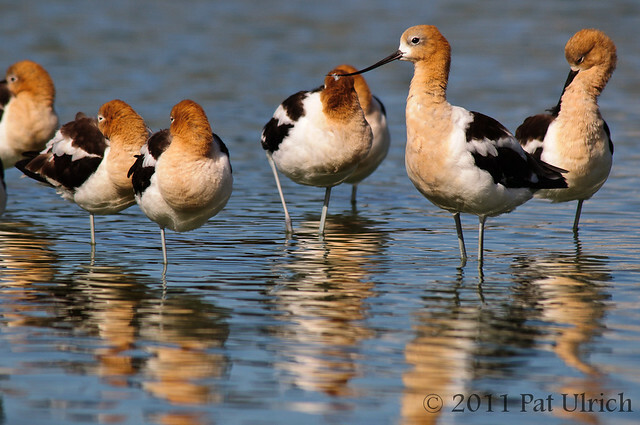 A few more shots from the nice encounter I had last month with a large flock of American avocets at Radio Road Ponds. 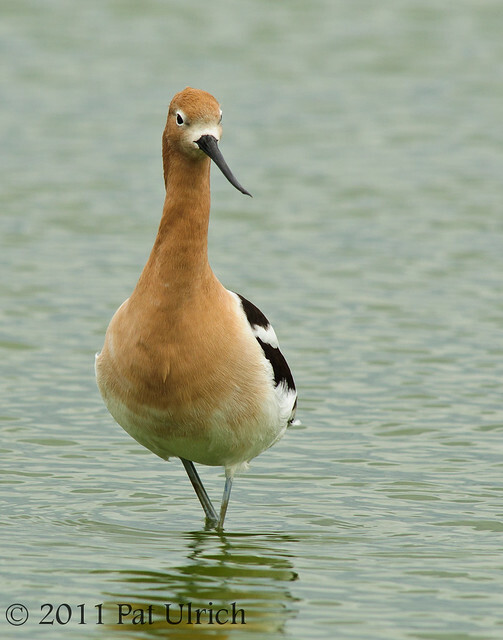 Mid-march is right at their transition time from the basic plumage, which is in grayscale, and their breeding plumage, with the beautiful cinnamon coloration. 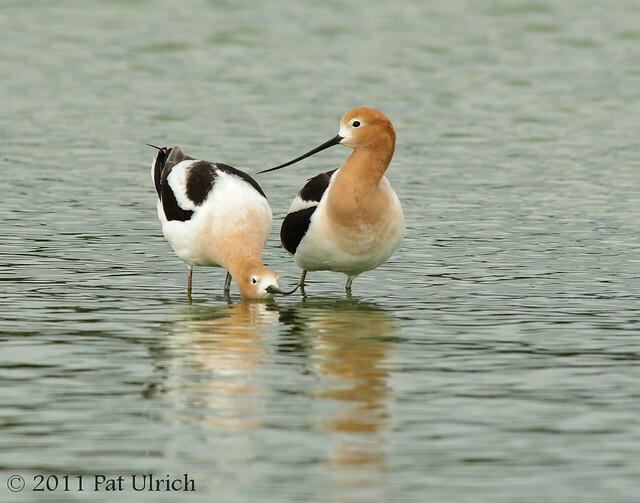 Regardless of their plumage of the day, I find these birds to be so elegant. 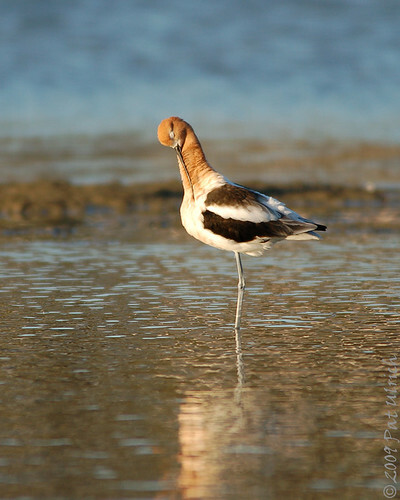 They stand tall, with a long smooth shape to their body and bills, and they just seem to float as they walk. 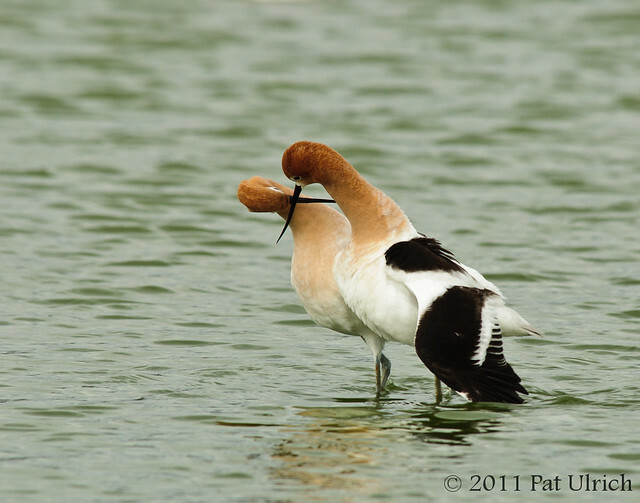 This is the second half of the courtship and mating ritual of a pair of American avocets that I witnessed at Radio Road Ponds in Redwood City. Here's a link to Part 1. As illustrated in Part 1, the male danced around the female and stopped to preen for a few minutes, each time seemingly gaining in intensity and getting closer and closer to the female. Soon enough he came right up to her side and began rapidly thrashing his bill through the water and splashing both of them. 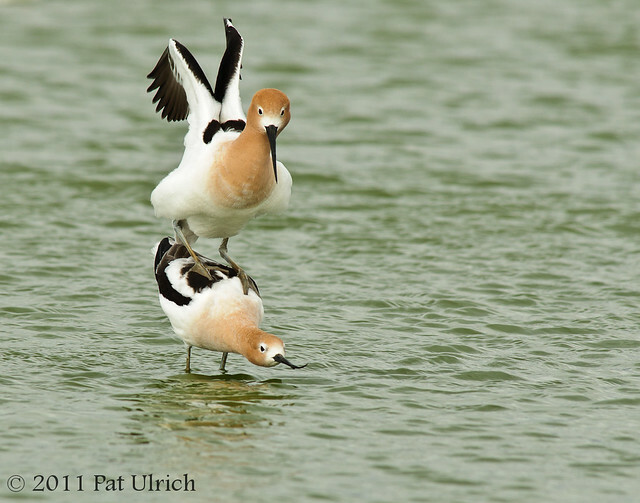 As quickly and unexpectedly as he started splashing, he stopped and immediately hopped on top of the female. He seemed to have a little trouble finding his balance at first, but then was able to steady himself. 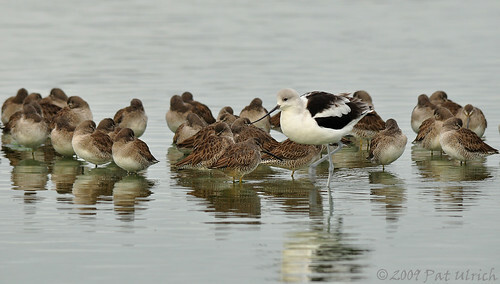 ...and the next generation of avocets was created. 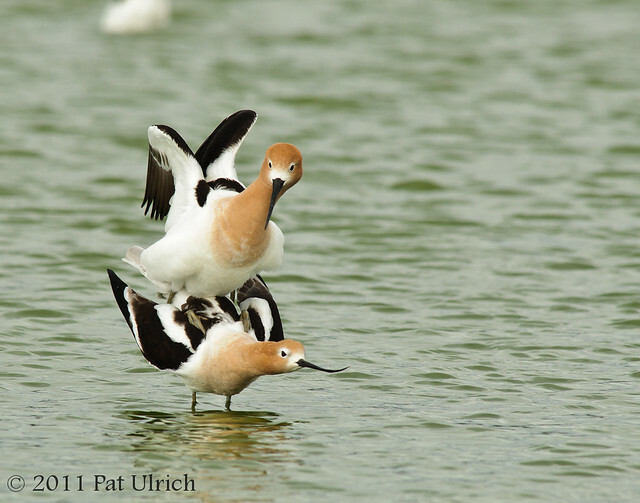 It took him a little while to find his balance, and the actual mating was pretty quick, but all the while I was firing off frames and marveling at the incredible ritual I was watching. Even with the excitement of photographing this special moment, I was carefully watching my buffer counter, since I wanted to be ready to try to capture a few frames of what I knew was coming next. 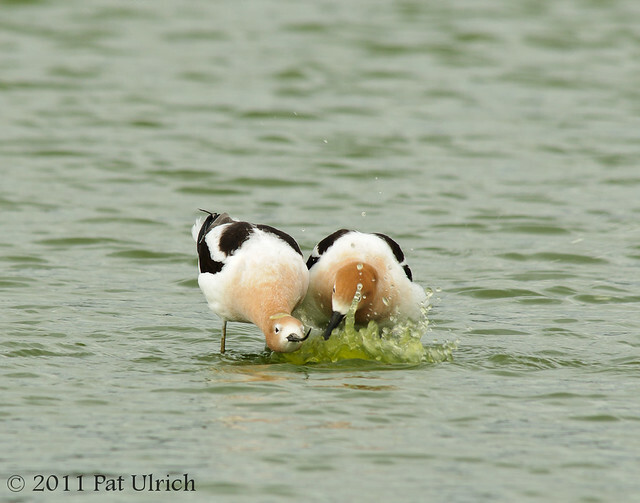 After mating, he hopped back down in the water, and the pair crossed bills and ran forward together for a few strides, the final step of their elaborate ritual. Unfortunately, I didn't get a really great shot of them running together, but it's such a wonderful moment to have witnessed through the viewfinder. After dropping my wife off at SFO a few weeks ago, I decided to make a quick stop at Radio Road Ponds to see what birds were around before it started to rain again. I've already posted a few shots from this trip of handsome northern shoveler drakes and of the large group of American avocets that landed right in front of where I was sitting. 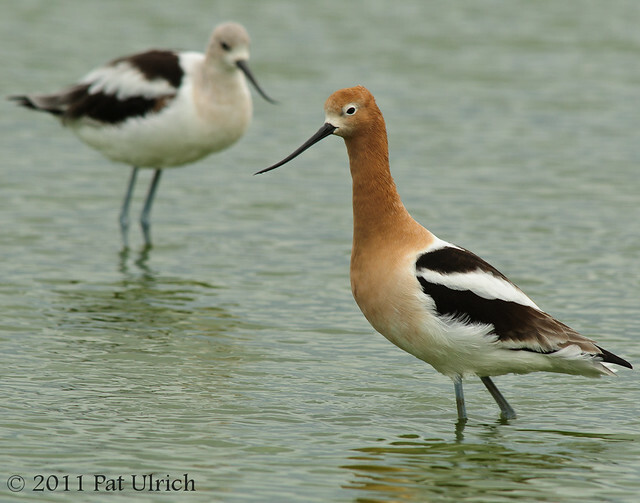 The birds were starting to turn to their gorgeous summer colorations, and it was apparent that a few pairs had already selected a mate. These two "love birds" spent time together on the outskirts of the flock. I was initially watching this pair just because they had moved closer to my position, but I was surprised and excited to see the female take her courtship pose. I had read about this interesting ritual and seen images of it before, but I had only previously seen it in person on one occasion, which was from quite a distance away. I was very lucky on this day to have a chance to witness this wonderful dance of nature from such a close distance. After she presented her courtship pose, he spent a few minutes walking back and forth around her, seemingly getting closer to her with each pass. 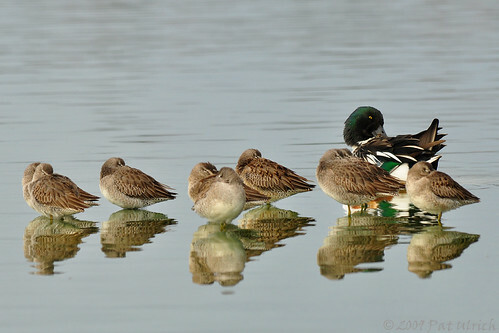 He stopped to preen by her side on many occasions, perhaps doing his best to woo her with his looks, and demonstrate what a great choice she had made. The preening is apparently a very important part of the courtship ritual, and he seemed to go at it in quite a frenzied way at times. The mating display lasted only a few minutes in total, and I've included images of the second half of the dance in my next post. 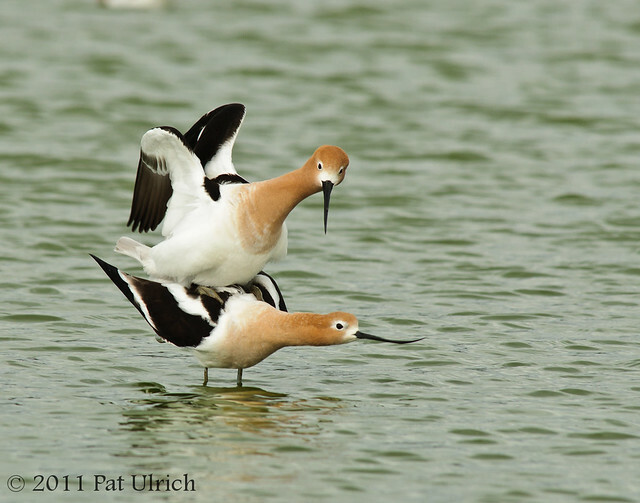 This post is part of World Bird Wednesday -- click the link to view all of this week's submissions! As I was sitting along the edge of the pond, a large flock of avocets flew a lap over the water and then headed straight for me. What a pleasure it was to have 50+ birds land right in front of me. 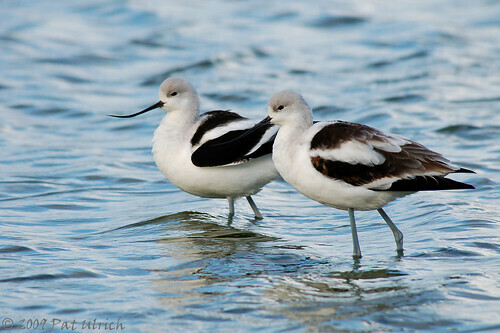 They are such lovely shorebirds, especially once they transition to their full summer colors. 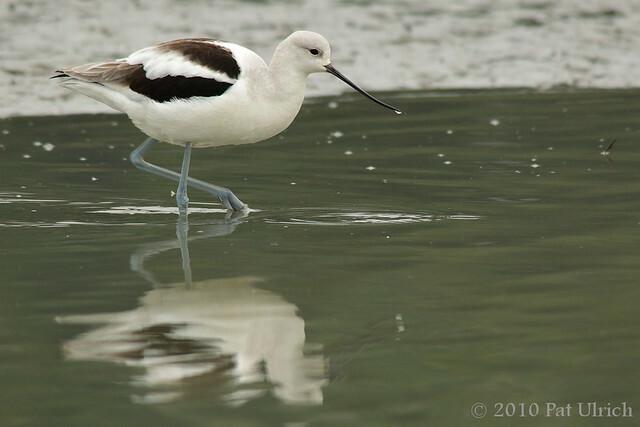 It's been far too long since I've posted a shot of a shorebird, and I'm glad to fix that with this American avocet at the Radio Road Ponds in Redwood City. 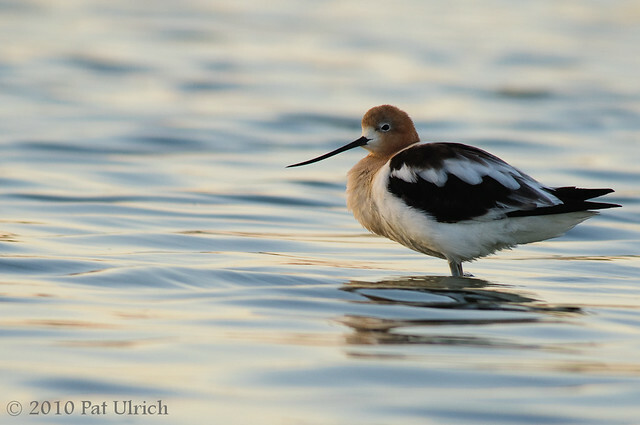 It's getting to that exciting time of year when the shorebirds are passing through the Bay Area from their summer on the tundra, and its always fun when you get to see some of the birds we normally get here in their basic plumage all decked out in their breeding colors. 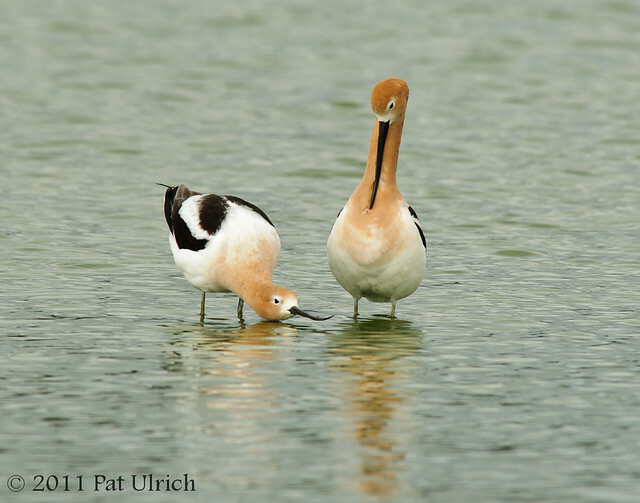 Of course, avocets are resident birds around the Bay, so we can take advantage of their beautiful colors all summer long. As an aside, the Radio Road Ponds are a great place to kill time while waiting to pick someone up from the airport. It's pretty easy acess to the 101, and only about 15 minutes from SFO. I took this shot just after the sun had set while waiting for my wife's flight to land. 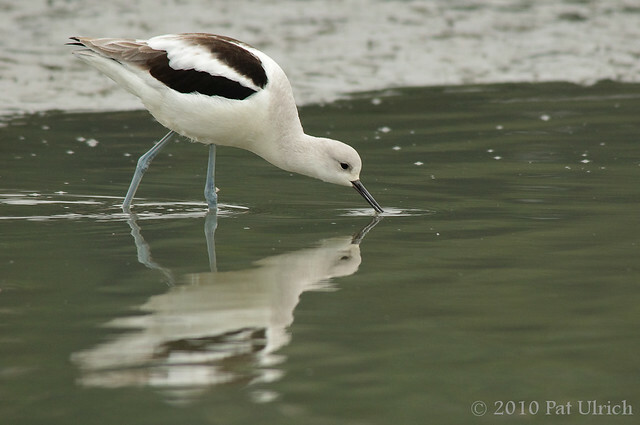 A sequence of images from a few trips to the Radio Road Ponds in Redwood City last year. 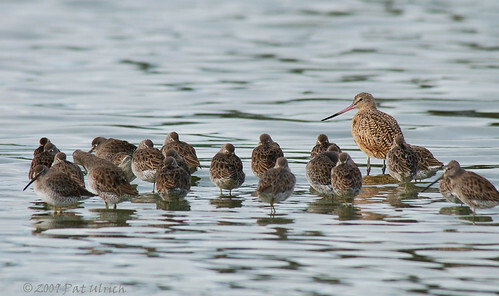 There's an area where the dowitchers like to congregate on an underwater ridge, and occasionally a larger bird will hang out there too. I enjoy seeing different species mixed together, and this provides a nice opportunity.